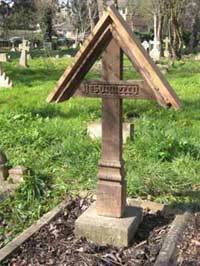 A characteristic feature of the gravemarkers in the churchyard is the pented (roofed) timber crosses, dating from the 1890s to the 1930s. They are constructed of oak, each has a roof (cap), originally covered with lead, which extends beyond the arms, and some have an inscription such as Jesu Mercy carved on the cross bar. Two have a small moulded metal crucifix and there is evidence that others did also. Many are badly decayed and some have collapsed completely. 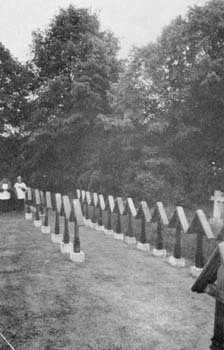 Timber was less expensive than the stone used for many of the memorials. 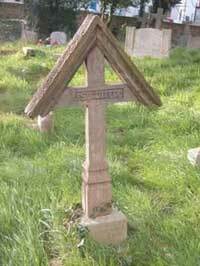 There was a simplicity about a timber cross that made it the preferred gravemarker for the graves of members of the Society of Saint John the Evangelist (see fact sheet 6 Religious Orders). Maybe this encouraged the association of pented timber crosses with the Anglo-Catholic tradition within the Church of England. Wood decays at a similar rate to the human body, making it a suitable material for marking a grave. 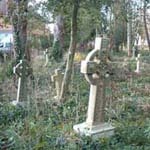 Despite the third suggestion, since the crosses have clearly been a feature of the Ss Mary & John churchyard but are now in a very dilapidated state, it was decided to commission a series of repairs and replacements that would preserve a representative sample of the timber cross types. This has been undertaken by Paul Simons of McCurdy & Co., historic timber consultants and conservators, who began the restoration work by surveying the existing timber crosses and the surviving plinth stones where the cross itself has disappeared. 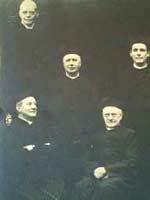 He also removed two of the broken crosses to their workshops in order to study them in detail. The restoration work has resulted in one completely new cross of each type, three repaired complex crosses, two new 'markers' (upright posts only) of each type to mark graves where the plinth stone still survives but where the timber is very decayed or missing, and two repaired crosses from the 1930s which were rotting badly having been fixed directly into the ground. 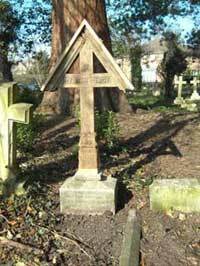 One grave had the remains of a complete timber surround and this has been replaced in new timber. A number of minor repairs have been carried out to wedge decaying bases or provide sacrificial cappings. This is well illustrated in the 'before' and 'after' photos, but what is even more important is the impact on the overall character of the churchyard and its power to convey something of the history of east Oxford and its people. They could be ordered by mail order and delivered by Rail. 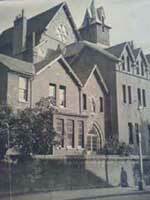 The churchwarden could order one for you. They could be ordered complete with inscription or plain for painting details on. They have lasted the ravages of time. The last is not wholly true: the ones in Ss Mary & John churchyard are very rusty. 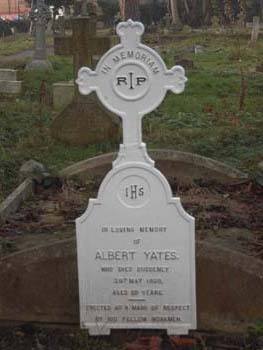 One that is definitely not covered by the generalisations, and that has been expertly restored, is a memorial (B155) to Albert Yates, who died in1899. It is set at the foot of the family grave in which he is buried, and includes the inscription 'erected as a mark of respect by his fellow workmen'. This suggests that he was himself a blacksmith, probably working in the neighbourhood.